When it comes to winters in the Northeast, you want a fuel provider that you can rely on to keep your family safe and warm. Talley Petroleum Enterprises takes this responsibility seriously and strives to provide the very best home heating oil delivery service at the best possible price. See how our customized fueling solutions can help make your heating season simple. Since 1961, Talley Petroleum has supplied top-quality home heating oil to homeowners across Dauphin County and beyond. Our friends, family, and neighbors have come to know and love the premium delivery and customer service that Talley Petroleum provides. While heating oil is our most common fuel for home heating, we are pleased to offer delivery options for other liquid petroleum products as well. Choose a delivery program that is best for your unique heating preferences. The Talley Petroleum customer service team is happy to work with you to discuss the best fit. Residential fuel delivery is available to customers located in Dauphin County or any of the other immediate surrounding counties. Talley Petroleum heating oil customers enjoy total convenience with our custom automatic delivery service. Using a Degree Day Monitoring System, we can accurately forecast your heating oil use based on outdoor temperatures. With this information, we will automatically schedule heating oil deliveries as they are needed. 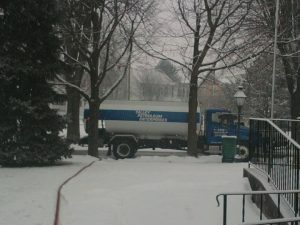 Automatic delivery is a great worry-free way to avoid running out of heating oil on a harsh winter night. Will call delivery is just what the name suggests. Simply give us a call or request a delivery online when you need fuel. This type of delivery option is best for customers that diligently monitor the fuel level of their storage tanks. Talley Petroleum recommends placing your order when your tank gauge reads between ½ and ¼ remaining. This one- or two-day notice will give us ample time to deliver your order and avoid a no-fuel emergency. Note: All after-hours deliveries are subject to an additional delivery fee. Let Talley Petroleum help you keep your home cozy from season to season. To become a residential delivery customer, contact our office or enter your information below. One of our customer service representatives will be in touch shortly to discuss your options.